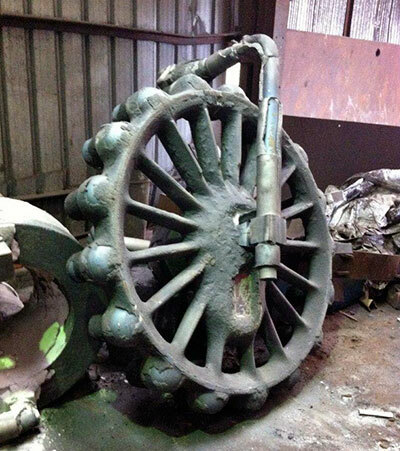 The headline news is that the first driving wheel has been cast at The Boro' Foundry. 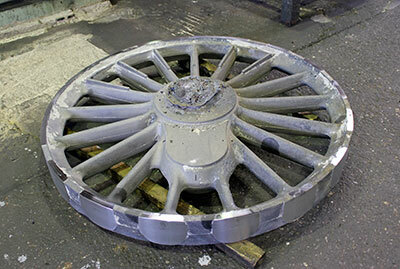 The photo shows the wheel in the cooling down stage following release from the mould and before fettling. Various tests will be carried out on this wheel before proceeding to cast the remaining wheels. 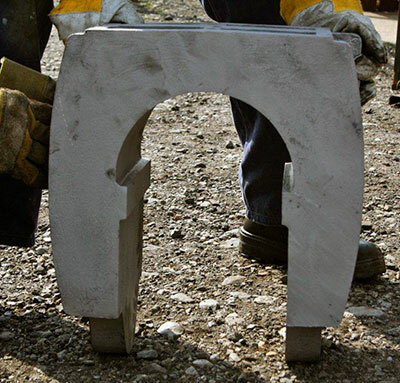 The six axleboxes for the driving wheels have been cast at the South Lincs Foundry, Spalding. These now require machining, fitting of manganese liners, bearing crowns and white metalling. 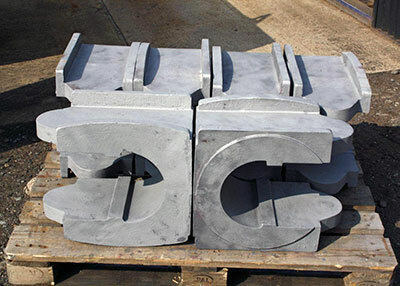 The keeps, already cast, will require machining and acquisition of oil pads. Machining of spring brackets continues. The horn guides and horn blocks are now all attached to the frame plates with fitted bolts and attention is now turning towards removal of the various stretchers etc. at the rear end of the chassis with a view towards a thorough cleaning of the joint faces and refitting for reaming of the holes and riveting. With income streams, present and projected, pretty well in hand for all other major components of 82045, we have been emboldened to consider bringing forward the launch date of the Boiler Appeal from Autumn 2014 to the early part of the year. Very simplistically, we have to fund the steel boiler barrel (front parallel and rear tapered sections), smokebox (steel) and firebox (copper) tubeplates, inner (copper) and outer (steel) Belpaire-profile firebox skins, firebox foundation ring and backplate, plus hundreds of stays of varying descriptions. Quite a daunting task, but with the increasing momentum coming from the support of our steadily-growing membership, by no means an impossible one! To give you an idea of costs, we have been unofficially quoted a figure of £30,000 for the boiler barrel. By far the most expensive component is going to be the firebox, and we are anticipating a total cost for the boiler of around £300,000. We are hoping for a good response to this, our final major appeal, so watch this space in about six months' time. If anyone feels moved to give the boiler appeal a kick-start in the meantime, please get in touch with Chris. There is a dedicated Boiler bank account all ready to start receiving funds! The first newly cast driving wheel. Photo: The Boro' Foundry. The wheel after some tidying up. Photo: Peter Line. Two photos of the newly cast axleboxes for the driving wheels. Photos: Tony Massau.